The Pens’ recent line changes helped them to two straight wins coming into Friday’s meeting with the New York Islanders at CONSOL Energy Center, but it was the tried-and-true line of Chris Kunitz, Sidney Crosby and Pascal Dupuis that gave them their third straight, as they combined for the winning goal with 1:16 left in regulation to give them a wild 4-3 win over the Islanders. The three of them were reunited after Beau Bennett left the game in the third period (coach Dan Bylsma did not have an update after the game). Kunitz went in hard on the forecheck to separate his man from the puck and Dupuis was there to pick it up and find Crosby in front, who put it past Islanders goalie Kevin Poulin for his 12th of the season and 250th of his career. “Yeah, they feel good,” Crosby said of getting late goals like that one. “And that definitely wasn’t our best game. We had a lot of chances and probably could have put it away early, (but) they hung around. They generated a lot. We gave them a few turnovers, but they’re a good offensive team. So to find a way to win that one is important and we’ll try to be better tomorrow (in Montreal). 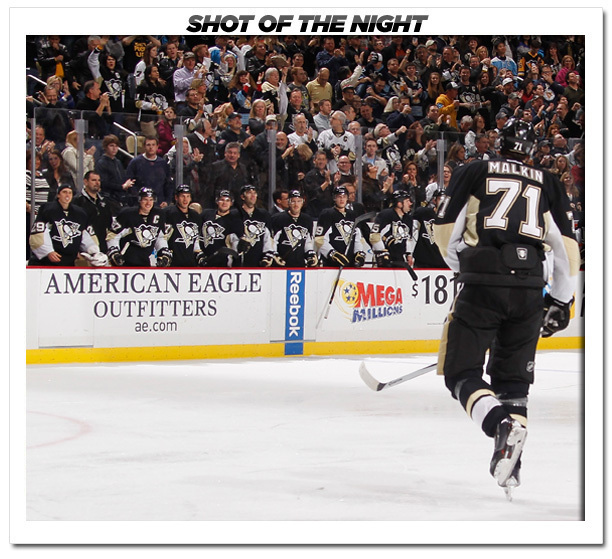 Kunitz scored twice while Evgeni Malkin snapped his career-long 15-game goalless drought. Jeff Zatkoff made 32 saves in his fourth start for the Penguins. During the second period James Neal found himself wide open, with the puck on his stick, right in front of the Isles’ net. Ninety-nine percent of the time, he’s going to take that shot. But on this particular occasion, he decided to give it right back to the guy who got him into such an ideal situation despite being surrounded by four white jerseys – Evgeni Malkin. Neal slid the puck right back over to his linemate, who dribbled it past behind Isles goalie Kevin Poulin to break his career-long 15-game goalless stretch. “Thanks to him for sure,” Malkin added with a smile. Malkin’s celebration was completely cathartic, as he slammed his stick onto the corner boards and punched the glass before launching himself into it like it was a tangible form of the frustration that’d been weighing on him this past month as he struggled to do what has always been so easy to him. “We were really happy for him,” Crosby said. “He had a ton of chances the last little while and we knew it was a matter of time. But although Malkin hadn’t been putting the puck in the net these past few weeks, he’d been helping everyone else do so. He added an assist in this game to up his league-best total for the month of November to 13 (and his team-leading total to 20). He now has at least one helper in nine of 10 games this month and has been playing some of his best hockey of the season. He had been playing particularly strong hockey in his last two games, both wins for his team. And that’s all that matters to Malkin. Part of that is because of the way he, Neal and whoever is on the left wing (Dupuis and Jussi Jokinen) have been able to produce extended shifts in the other team’s end. After a dominant first (more on that below), the Pens let the game get away from them in the second. They Pens had trouble keeping leads against the Islanders in their first meeting of the season, and they had more issues again tonight – especially in the middle period. Thomas Vanek cut the lead to 2-1 early in the period, while Malkin’s tally regained the two-goal lead for Pittsburgh. But it didn’t last, as the Isles scored a pair of goals 1:21 apart to tie the score and cause Bylsma to use his timeout to settle his team down. Crosby explained what happened, saying, “Well, we have the lead, so they start taking chances and then we kind of get sucked into playing that style of game. They’re pinching a lot and we’re getting an odd-man rush and instead of managing the puck, we’re taking chances and kind of throwing the puck everywhere. After the power play combined for gorgeous goal by Crosby on Wednesday in Washington, the Pens treated the home crowd to more magnificent execution on the man-advantage on Friday in Pittsburgh. With the Islanders entering the game with the NHL’s worst power play, giving the potent Pens three power plays in the first 7:42 minutes of play is not an ideal situation for them. But they did, and they paid for it a Pittsburgh converted two of them – both scored by Kunitz. The first, scored 4:04 into the game, was just as pretty as Crosby’s against the Capitals. It was another amazing passing play, except the Pens only needed three guys for this one instead of four. Malkin sent a sick backhand pass across the bottom of the slot to Crosby, who fired a sick diagonal pass to Kunitz on the back door – who deflected it perfectly into the net. Kunitz didn’t hesitate to put the puck on net on his second goal, scored on Pittsburgh’s third power play. Paul Martin, who replaced Kris Letang on the top unit for this game, swooped in and started a quick transition the other way. He passed it up to Neal, who slid a pass across to Kunitz for the one-timer that flew past Poulin.